Tai and Georgia - the Swazi's call them our "lions". On October 5th we will celebrate our 25th wedding anniversary, and what a wild and crazy 25 years it has been! For the past six months we have been planning a fun-filled trip back to the US and Canada to celebrate with friends and family. But alas, our dogs decided that they really wanted us to stay here instead and due to a fluke accident last week, our anniversary trip has been cancelled. Here is what happened. Ian was letting out the “big dogs” which are locked up in a large pen during the day and let out to roam within our electric fencing at night. They keep snakes and wild animals away, and Swazi’s are TERRIFIED of them. One of our female Boerboel’s (named Tai) loves to horseplay with our male Doberman named Max. Each of them weighs 130+ pounds. Ian opened their gate and out they rushed. Unfortunately the two rambunctious dogs took an unusual path down to the house and ran in to Ian’s left knee and he dropped to the ground. I got a phone call from Ian, and he said was, “I need help.” I ran out in to the darkness to see him lying on the ground waving his flashlight in the air so I could see where he was. He was writhing in pain and the dogs were standing over him, licking him (and feeling VERY badly!!). Tai, Max and Jack ... they're really really sorry. Kenny came to the rescue and helped Ian get down to the house and in to bed, with ice, Advil and prayer following. On Ian’s 51st birthday he went and saw an orthopedic surgeon in Swaziland who drained 4 oz of blood off the knee and told him to take it easy. Three days later, while wearing a brace, Ian’s knee twisted while in the house and down he went, cracking a rib and further damaging his knee. On Tuesday we were sent to South Africa to see a knee specialist to have an MRI and make sure that he would be okay to make the 17-hour flight on Friday and start our anniversary trip. The specialist saw us first thing Wednesday morning and by 3PM that day Ian was in surgery (in a city we don’t know in an African country). 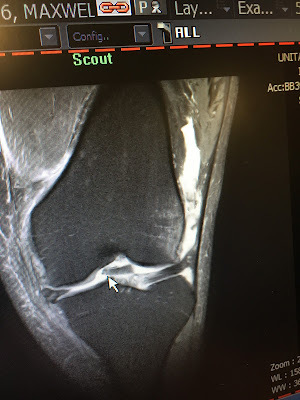 It appears that when the dogs hit the outside of his knee, the knee cap pushed over the other side of this tibia and a chunk of his knee cap was knocked off before the knee cap slid partially back in to position. 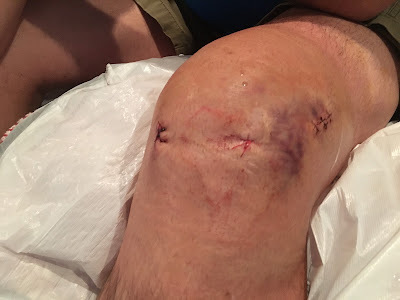 The ruptured ligaments allowed blood to pool under his kneecap and keep it out of position. 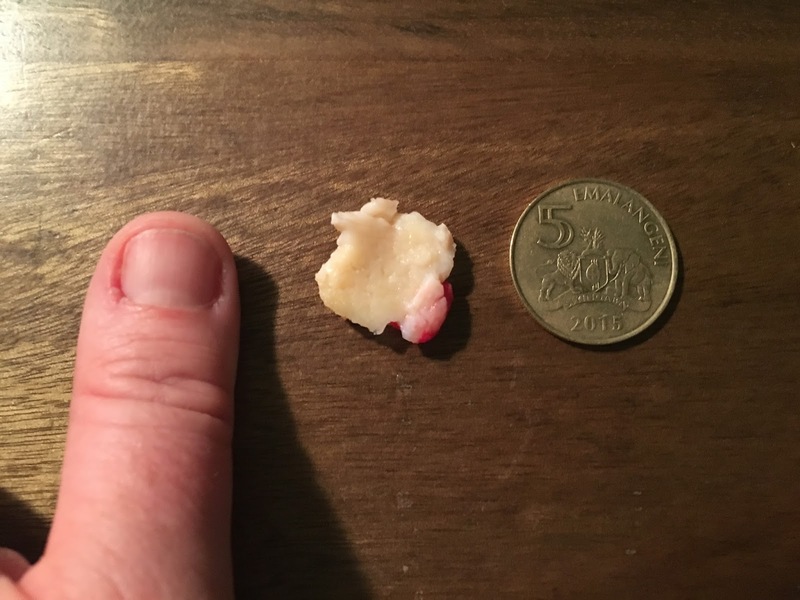 The bone chunk (the size of a quarter) slid down the front of his kneecap and lodged in between his tibia and his femur. OUCH! We drove half way back to Swaziland Thursday afternoon and made the call to cancel our trip. Last night (Friday) were to have driven 5-hours back to Johannesburg and then gotten on a plane to fly to the US for three weeks that would not have been filled with pain, frustration and unnecessary stress,. So many people have sent us kind words of encouragement and support, and we really appreciate that. Both Spencer and Chloe have called several times to check on their dad and tell us that they fully support us cancelling our trip, and that warms my heart (and helps slow the tears). 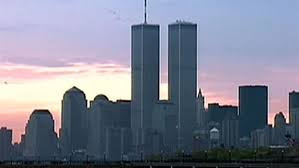 In each call we remind each other that it could have been much worse. We are not dealing with a poisonous snakebite, deadly PCP pneumonia, Multiple Drug resistant tuberculosis or many of the other things we deal with each and every day. This is an inconvenience (and obviously painful for Ian), not a crisis. It’s an inconvenience because I needed oral surgery to fix a tooth that has been broken for months. I need to see my ophthalmologist to get an updated prescription because I am almost out of contact lenses. Then there is our ““buy in the US/Canada” list of things that we can’t buy here that will go un-purchased, and Christmas gifts will need to be purchased in other ways. It’s an inconvenience because we have to cancel our annual Heart for Africa board meeting and we won’t be able to attend the Heart for Africa annual golf tournament. But it is an inconvenience, it’s not the end of the world. Of course the hardest part is that we won’t be able to spend time with Spencer and Chloe, who we only see together once a year (at Christmas). We will miss Ian’s dad’s 80th birthday party and Canadian Thanksgiving. We have cancelled our 25th anniversary party where most of our wedding party was going to gather again and we would have had delicious food and a few good laughs with lifetime friends. But that is life. Serving in Africa ain’t for sissies, and but we are thankful to have the opportunity to do it, even with the bumps and bruises along the way. Today I have peace. I haven’t slept much in the last two weeks, but got a solid nine hours in our own bed last night. Ian is in a brace on the couch watching Diners Drive-In’s and Dives and is comfortable. There is homemade chili cooking in the crockpot and the laundry is almost complete. Life is good, and I am thankful. Live from Swaziland … livin’ the dream. September 15th was Ian’s birthday. It was also babies Robert, Bernice and Moses’ birthday and they all shared a GIANT cake and celebrated with 39 of their brothers and sisters. September 15th was also my mom’s birthday (baby Bernice was named after my mom because they shared the same birthday), but there was no Skype call or chocolate dipped strawberries delivered this year since she passed away in February. September 15th should have included cake for Baby Megan, but again, that was not to be as she passed away last month, and was buried on Project Canaan. Ian’s birthday celebration was an epic fail. It kind of snuck up on me to be perfectly honest. On September 13th, Ian was letting the big dogs out of their dog pen and two of them (120+ pounds each) ran in to him on the side, dislocated his knee. He dropped to the ground writhing in pain and then called 911 (me) for help. Once I found him on the ground (waving his flashlight in the air so I could find him), I called 911 (Kenny VanWinkle) and he came to our rescue and helped Ian get home. For Ian’s 51st birthday he got to go to the orthopedic surgeon and have 4 oz of blood drained off his knee and a cortisone shot. We did some grocery shopping, picked up KFC (I can’t believe I am even telling you that) for dinner and then I realized that I also forgot to buy him a gift or bake him his favorite Angel food cake. To make it worse, we were late getting back to the farm and completely missed the birthday celebration with Moses, Bernice and Robert. The birthday party was over and even dinner was finished by the time we got back to Project Canaan, but we stopped in to the toddler home to at least give the kids a birthday hug. Unbeknownst to me our wonderful “Nutrition team” baked Ian a beautiful chocolate birthday cake, in the shape of a heart, and on it was written “Happy birthday Daddy Ian”. Ohhhhhhh, be still my heart! Ian with Moses, Maxwell and Robert. Bernice was back at the baby home. Friday was a better “birthday day” and we celebrated with our friends Chris and John, and the Angel Food cake made it to the table. I am so thankful for my husband Ian and the man that he has become. On October 5th we will celebrate 25 years of marriage – what a wild 25 years this has been. Happy birthday Ian! I love you. Live from Swaziland … lamb burgers and Angel Food cake for dinner!